Redpill Linpro has together with its customers released two new open source modules for Alfresco that are available for free under the LGPLv3.0 license. A module that provides tools for generating sequences in Alfresco suitable for document numbering. A very common requirement when implementing Alfresco is to provide a custom data model. Very often this also include a metadata field that hold a unique document number. The document number can be used to clearly indicate for the user that this is a unique document. User are also able to search for a particular document using the document number to be able to quickly find and use documents. The tools provided with this module can also be used to generate sequences for other use cases than document numbers; Case IDs, Folder IDs and project numbers are common use cases. The source code is available on Github along with instructions on how to get started. Thanks to Alingsås Kommun who sponsored the development of the module! Provides tools for displaying system wide messages to users. 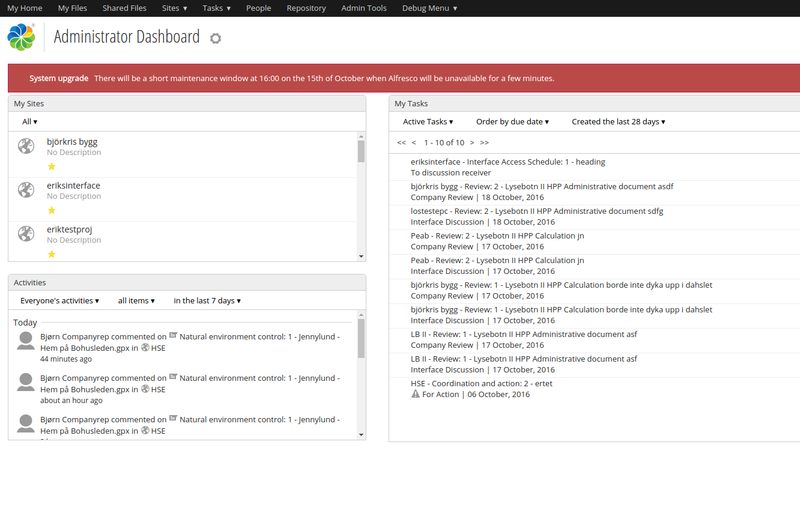 Typical use cases are to display upgrade notices, planned system maintenance or simply information to all of your users. System administrators can create the messages using the Admin console. It is possible to define start and end dates for the messages to determine when the messages should be displayed. It is also possible to set a priority on a message which will change the display color of the message. The source code is available on Github along with instructions on how to get started.